With Int being higher on this than Stam i would wonder if its geared more for a mage than a lock. It should be noted that, once you include the sockets, Water-Drenched Robes have almost identical hit rating and damage. Depending on sockets, you end up with slightly more +dmg and slightly less hit, or slightly more +hit and a tiny loss of +dmg. All you're getting with these robes is higher intellect - something that I, personally, plan on passing up in order to save money for more important things. All you're getting with these robes is higher stamina and intellect - something that I, personally, plan on passing up in order to save money for more important things. I think we all learned how important stamina is in raid designs now and during later BC raids and this will probably remain true in WotlK raid design. If you plan on raiding at all, it's probably worth the extra effort for some added survivability. I absolutely loathed having to wear items like Spellstrike Hood for such a long period of time, only because it had better damage/hit/crit and no luck with raid drops. The extra padding is necessary when available. Min/Maxing is still alive and well. Maybe you didn't notice, but there's a 90 health difference between the two. If you gem with a Glowing Twilight Opal, you end up GAINING stamina with the blue robes. My point remains: the time or money spend getting these robes is going to be put to better use by me, and could probably be put to better use by 99% of everyone else getting them too. EDIT: There was a comment in there (about min-maxing health), I swear I'm not talking to myself! I wonder what the new spell hit cap for mages and locks will be. Hear Affliction is going to be the raiding spec for raiding for locks. The old 1-3 button warlock days are over if this is true lol should be interesting. At level 80, with no talent reductions or debuffs from other classes, one would need 634 hit rating to be capped. 442 is not correct. At the time I post this the conversion listed on the item (1.82% @ L80) is way way off. The untalented spell hit cap is 446. I imagine spell and melee hit being the same stat yet with different conversions is confusing things. The lack of spirit make it abit dodgy for a shadow priest trying to get to hit cap T7 appears to be on the valid option for a shadow priest. Too be 100% Honest, Spirit Really doesn't do much for my Shadow Priest. Alright, I get Increased Spellpower by 10% of my Spirit... And that's assuming that there isn't a Disc Priest in my raid. Although Spirit is would useable for Some Shadow Priests, But seeing as that I'm NOT Med spec'd, Spirit honestly isn't that important to me. Therefore, I think the Gloves + Robes of Ebonweave are fantastic! And if anything... You can always make up for the 'lost' spirit with other pieces of gear. The only reason I got these robes was because the mats are not nearly as much as I thought they going to be. If you are patient and craft the Ebonweave yourself, then these are great pre-naxx robes. They will be replaced fairly quick I'm assuming, but will help a ton for Hit starved casters. And with one 14 spell power gem and one 7 spell power 9 stamina gem these robes have the exact same hit rating, but the robes have 94 spell power, but if I put a blue spell power gem in its 99 spell power, 6 less than these robes but they are free. One thing to consider with the linked robes is that they do have more +hit on them if you gem for hit. It's certainly an important caster stat. Of course, it's a heroic drop vs. something you can simply farm mats for so it makes sense that many would just go for the Ebonweave chest. I found that Blue Workman's Shirt and Tabard of the Argent Crusade together with this are aesthetically pleasing. Highly recommend these as a Boomkin. The hit rating is just incredible. Farmed H VH for a while for the Water-Drenched Robe, but it just wouldn't drop for me. If you can afford the ebonweave, it's really worth it to pick up. I can't seem to disenchant these. Kinda annoying now that I've replaced them with T7 and I need Abyss Crystals for the new enchant. the forementioned http://www.wowhead.com/?item=43401 would be worth getting until you can get this. as for the robe itself, it is simply brilliant. the mats for the robe itself are rather cheap, costing a grand total of about 300-400g depending on your server. conidering people are willing to pay upwards of 2500g for this, it may well be worth buying ebonweave and frozen orbs to sell on the robe for a profit. So, when gathering the ebonweave for these robes, I recommend standing in Dalaran and say "WTB ebonweave cd - mats + 50g - pst" in trade. I've gotten 6 ebonweave like this so far and it's much cheaper for me, but it may be different on other servers. All that said, the robes are definitely great for entry level raiding, especially for the +hit. I recommend this and the ebonweave gloves if you don't have time to run heroics often. are these even worth making for the 700-900g mats? 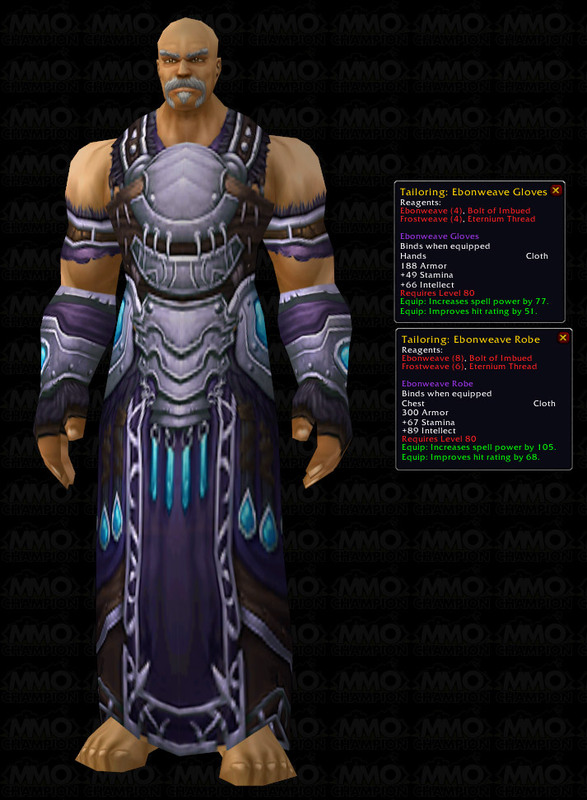 You know its sad, when this robe trumps http://www.wowhead.com/?item=39523#. Until you have a 2nd piece of T7, then its superior. "Screw the blue staff Jimmy, we're goin' for the epics! EPICS!" And let's not forget that one all-important fact: it's a purple item, as opposed to a blue one. Nevermind how the stats stack up against each other; when a raid leader is armorying to decide who to invite (or kick, or blame for a wipe) he/she is going to just give a cursory glance at how many epics you have versus the rares. No one is going to take the time to compare stats and say, "Oh, that piece is just a tad better than the blue robe that drops off one of the bosses in heroic VH;" that purple color is going to make raid leaders a little better favored towards you regardless of how much better it is than a blue. If you use this argument, you are on the wrong page. Glacial Robe is far easier, both to obtain, and on the wallet in terms of cost. Plus it does not use a cooldown related cloth. It is also good to know that the Glacial Robe will help you get your Epic achievement, if that is required on your server. How is it,that these robes have ilvl 200 along with the rare robes dropping from ichoron?